Despicable Me 2 a Riot for Kids...and Their Parents! Despicable Me 2 Is In Theatres Now! If you're the parent or grandparent of a child, you've likely been begged to see Despicable Me 2. My kids are fans of the first Despicable Me movie, and I can vouch that they asked for months to see it. We have watched the first movie a googolplex times at home, and the story, voice acting and humour hold up to repeat viewings. My husband and I took our 5 kids, aged 3- to 8-years old to see a Despicable Me 2 advance screening in 3D, and quite frankly it was a riot for our whole family! Children and adults alike were hooting and howling in the theatre, which is the ambiance that you want when viewing a kid's comedy. One adult behind me was whooping so hard and fast, she had to deploy an airbag to calm herself. The 3D was not overdone at all, and was used to add richness, depth and surprises to the movie. Scenes Like This "Beach Bum" Scene in Despicable Me 2 "Cracked" Up the Audience! Can Gru find the bad guy before his yellow Minions are turned vicious and evil? Can he also open his heart to love, and find a wife for himself and mother to his girls? You will have to see Despicable Me 2 in theatres to find the answer to these, and other questions! 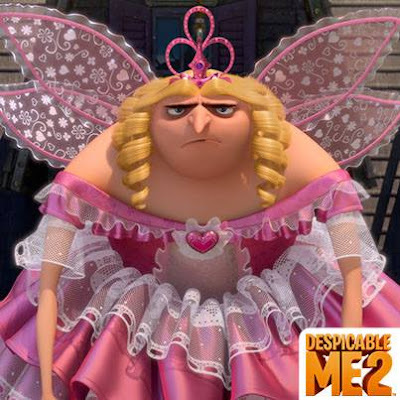 There were so many laughs in Despicable Me 2, but the best laughs were Gru dressing up as a fairy princess for his daughter's birthday party, his Minion pretending to be a siren during an emergency (Bee-Da, Bee-Da, Bee-Da! ), the Minions performing Village People's YMCA song, and another Minion showing his bum before diving into the ocean. (Okay, kids will laugh at anyone's bum!) The Minions did consistently get big laughs, so it's no wonder that Universal Pictures will be releasing a spin-off of Gru's Minions as the main characters in December 2014! According to my daughter, Despicable Me 2 was even better than the first. She does have a point too: I'm hard-pressed to crown a winner between Despicable Me and Despicable Me 2. What I can say is that Despicable Me 2 was a great family-friendly movie, and I would highly recommend it for those seeking a good laugh this summer! 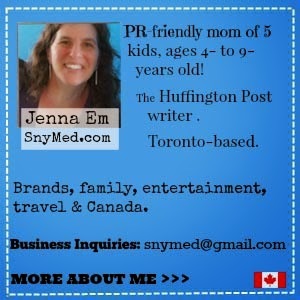 Follow Universal Pictures Canada and Despicable Me 2 on social media! Have you seen Despicable Me? Are you planning on taking the kids or grandkiddies to see Despicable Me 2 this summer? I'm looking forward to this one! It's nice to be able to say that about kid's movie. I cannot wait! My son will love this. I want to see this this weekend. I love the Minions!!! SO gosh darn cute. Despicable me is loved by all ages! I see so many people going crazy the toys at mcd! Kaelyn is really digging the minions right now! Which is fine by me cuz their HA-larious!!! Ah Despicable Me. A must see in our household. Bring it on Minions!! Despicable Me is our family's absolute favourite movie. Can't wait til the next one is released. LOVE MINIONS! i love despicable me! it has to be one of my fav movies! so glad you mentioned this!!!! I love Despicable Me and I have not yet seen despicable me 2 yet. I love the minions so much I made minion eggs for the kids to hunt tomorrow! My girls love despicable me 2. They love the minions, it's such a cute movie. I love this movie and so does all the people I know. Such a cute movie! My family first watched this in the theatres when it first came out, and then we watched it again several more times during our family movie nights since then. We just love it so much!! Canada Post ePost Keeps Your Bills Together! Have YOU Tried Shelf Safe Milk? Milk Unleashed! Disney's Teen Beach Movie & CONTEST (~OVER~)! Disney Junior Sizzles This Summer! Guess What You Can Win, Summer Lovers? Our A Turtle's Tale 2 Party! On DVD July 9th!